Perseus follows Cassiopeia across the night sky. It’s fainter, but has a graceful shape and some of the sky’s most interesting stars and star clusters. 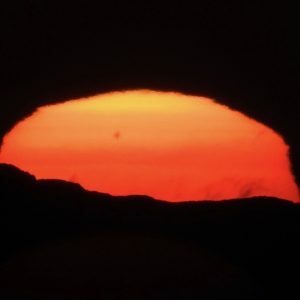 Let’s say you’re in the Northern Hemisphere, and you’re looking in a dark sky during the evening in autumn or winter. You can see the easy-to-spot constellation Cassiopeia the Queen, with its distinctive M or W shape, depending on what time of night you see it. What else should you look for? 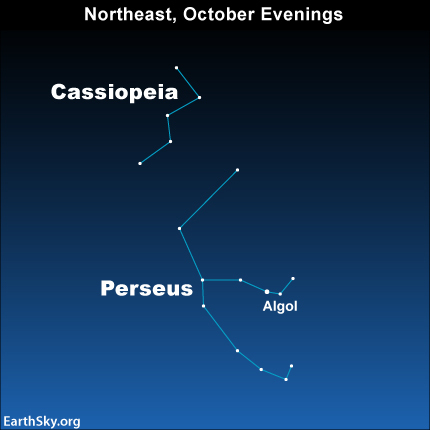 Try identifying the constellation next-door to Cassiopeia, which is called Perseus the Hero. Perseus follows Cassiopeia across the night sky. Cassiopeia is easy to identify and so it is one of the most famous constellations in the sky. Perseus is fainter than Cassiopeia and its stars are not so easy to identify. But if you have access to a dark sky, you’ll spot its graceful shape. 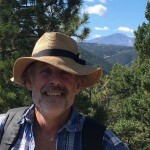 You’ll see them both in the northeast on an October evening, and higher up in the evening sky in late autumn and winter. Or, as night passes, you’ll see them both ascending in the northeast – then arcing high in the north – then descending in the northwest – with Perseus following Cassiopeia all the while. Cassiopeia is easy to find with its shape of an M or W. Perseus follows Cassiopeia across the sky. The brightest star in Cassiopeia is Shedar. The brightest star in Perseus is Mirfak, and you’ll also want to identify the most famous star in Perseus: Algol, the Demon Star. After you’ve found Cassiopeia and Perseus, be sure to scan with your binoculars between them. Assuming your sky is dark, you’ll easily spot the magnificent Double Cluster in Perseus. Both Perseus and Cassiopeia are considered to be circumpolar from about 40 degrees N. latitude to further north. In other words, as seen from northern parts of the U.S. and Canada, they never set below the horizon, but instead circle endlessly around Polaris, the North Star. 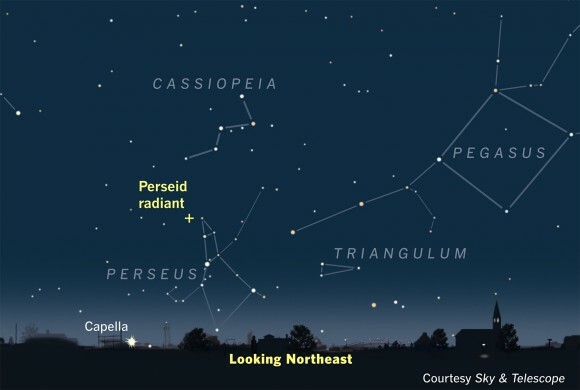 And, although they are best seen in the evening in autumn and winter, you can also see Cassiopeia and Perseus in the middle of August, from late night until dawn. The annual Perseid meteor shower peaks around August 12 or 13, and if you trace the paths of these Perseid meteors backwards, they will appear to originate between these constellations. View larger. 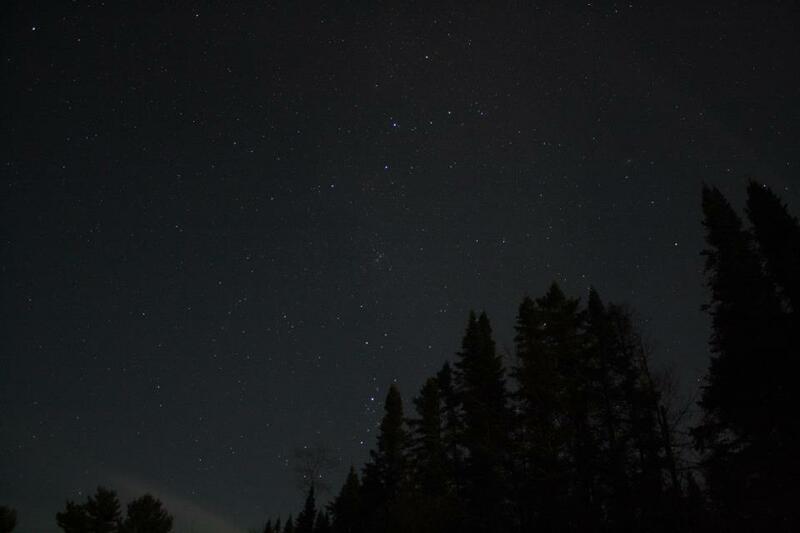 | Cassiopeia, with Perseus just appearing above the treetops, via EarthSky Facebook friend Migizi Gichigumi in northern Wisconsin. See the two, barely visible fuzzy objects between Cassiopeia and Perseus? They are H and Chi Persei, two star clusters you can pick out with binoculars. Bottom line: Look for the constellations Cassiopeia and Perseus in the northern evening sky during the upcoming winter months.